There are lots of points up for grabs with this one, what with several body parts to name as well as the organism to which they belong needing to be identified. Rules and points will be awarded roughly as outlined in the inaugural ID Challenge – i.e., ﻿﻿﻿﻿points are not mutually exclusive, with comment moderation turned on while the challenge is open to allow all a chance to participate (﻿no advantage to those with trigger fingers). Points will be awarded for correct taxonomic identifications (order, family, genus, and species – 2 pts each) and for each body part correctly names (2 pts each). Bonus points may be awarded﻿ at my discretion for . Coleoptera, Lucanidae, Lucanus elaphus. 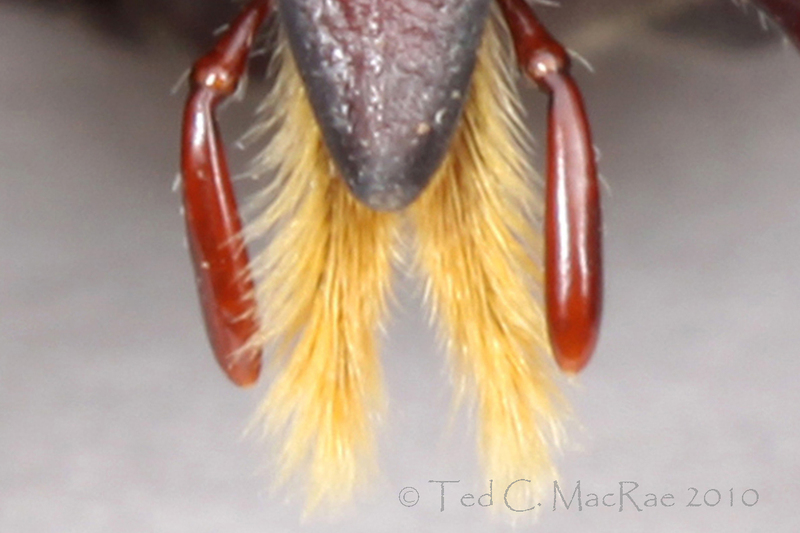 I think there’s a pair of labial palps, the labrum, maxillary hairs and part of a foreleg. I’d like to change the foreleg to the left mandible. Dunno what I was thinking there. Nope, not the left mandible either, but rather the left maxillary palpus. Good job on the ID, and a bonus point for proper italicization. You have the parts mostly correct, but I’m only going to give you 1 pt for the “maxillary hairs” – the structure is part of the maxilla, but it has a more correct term. I believe the structures are, and this is my best guess, the labrum, which is the pointed top structure. Since it is triangular, this helps identify the species. The smooth jointed structures on either side are the labial palps and the feathery yellow structures are the paraglossae. Thanks for the fun quiz! It got my brain working again after all the holiday brain drain. Awesome – full points for the ID, and I’ll give you the bonus point for italicization. You also get points for the labrum (and a bonus point for mentioning this as a diagnostic character for species identification) and the labial palps, but the feathery structures are the maxillary galeae rather than paraglossae (the latter being part of the labium and, in beetles, generally fused with the glossae to form a structure called the ligula). Is it Strategus? I just think they look like beetle mouthparts. I’m interpreting the two appendages on the side as labial palps. Not Strategus, but in the ballpark (superfamily Scarabaeoidea). I’ll give you 2 pts for the order (and a pity point for the superfamily), and yes those are labial palps. I’ve forgotten the genus for this elusive beast, the so-called “critic beetle”. Wasn’t the specific epithet longilabris or genaeshaliti or somesuch? Hmm, I don’t know what a “critic beetle” is, and my Google of ganaeshaliti comes up empty. But I’ll give you two points for saying it’s a beetle. Alas, it seemed funnier when I wrote it. I guess Gene Shalit jokes don’t always work! Perhaps I should have gone with Jamie Hyneman or some other famous mustache instead. Oh, man that is funny (I’m kinda dense sometimes). Two points and an honorable mention for that one!